Following a coup in Kyiv in February 2014, Russia first helped former Ukrainian President Viktor Yanukovych move to Crimea and then he was evacuated to Russia, Russian President Vladimir Putin said. "I won't conceal it that we helped him move to Crimea. 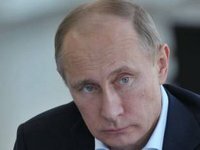 At that moment, Crimea was part of Ukraine," Putin said taking questions from participants in the Valdai International Discussion Club in Sochi on Friday. Yanukovych "stayed in Crimea for several more days," he said. "But as the events in Kyiv were developing very quickly and violently, it made no sense for him to return to Kyiv in those conditions. Everyone had forgotten about some agreements with the opposition signed by foreign ministers and about our telephone conversations," Putin said. "Yes, I'll tell you openly: Yanukovych asked to be evacuated to Russia, which we did," he said. And the people in Crimea, "seeing how the events were unfolding, almost immediately took up arms and asked us to conduct the procedures that they planned to do," Putin said.